Ladies and Gents, I’ve been there. You are just standing in the store staring at the wall of clothing or gadgets wondering what in the world is my guy going to like for a gift. Don’t worry! 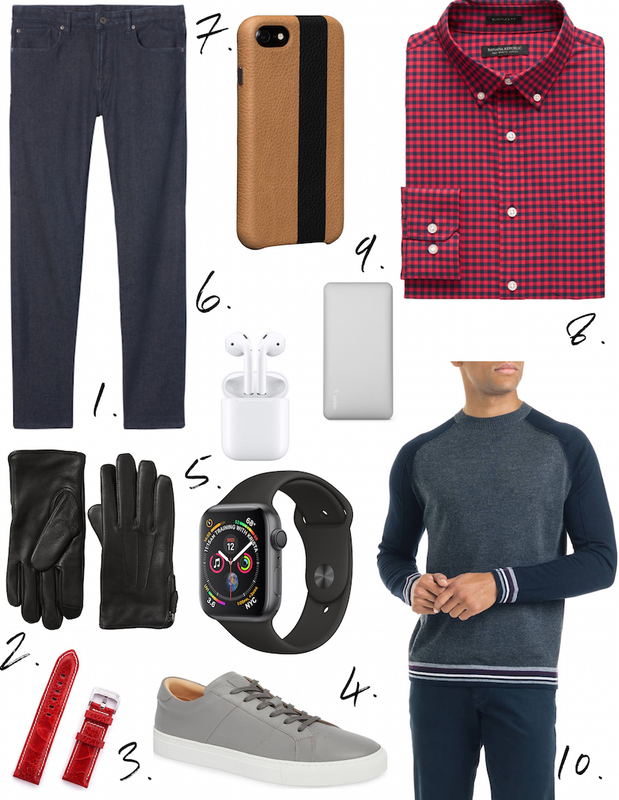 I have created a gift guide just for men with some of my favorite guy pieces and my husband’s faves too! 1.Denim: This might be the millionth time that I have talked about these jeans on my blog. My husband, my clients and I swear by them. The Traveler Denim from Banana Republic has just enough stretch, wrinkle free, and are completely functional. They actually make guys want to wear jeans because they are COMFORTABLE. They also come in several colors. 2.Leather Gloves: This is a great idea if your guy swears he doesn’t need or want anything, especially if he’s not a clothes guy. A great pair of leather gloves is something that he wouldn’t traditionally by for himself but something that he will get great use out of. 3.Rebel Savant Watch Band: Are all men obsessed with watches? Seriously, how many is too many? Thankfully, Rebel Savant created interchangeable watch bands. Keep the same watch face and buy different bands instead of completely brand new watches. How fun is this red leather one?! 4.Gray Sneaker: Every guy needs a sneaker that isn’t a workout sneaker. Wear these with chino pants, denim, and shorts in the summer. They are completely versatile and allow a guy to dress up his look a little bit more. 5.Apple Watch Series 4: Have a tech guy on your hands like me? An Apple Watch is a must. They are great for the working guy, gym junkie, traveler, and the list goes on! 6.Apple Air Pods: Again, just like with the watch these are a great gift for someone who loves a good gadget. Say see you later to cords on your headphones. The Air Pods are great for someone who is always on the go and on their phone and awesome for working out and travel. 7.Phone Case: Something that guys probably don’t think about much is their phone case. I love the sleek look of a good leather phone case. It is professional but also functional because it prevents their phone from slipping all over the place. 8.Non-Iron Button Up Shirt: Yes, you heard it right, a non-iron dress shirt. These are amazing and actually don’t need ironing. Meaning these shirts are longer lasting in a mans wardrobe and also allows them to grab them and go, cutting some time out of their mornings. They also pack great! 9.Portable Charger: My husband and I both have portable chargers and let me just say they have saved our butts way too many times. Great for a busy lifestyle and someone who uses their phone for everything. Also makes a great stocking stuffer! 10.Good Man Brand Sweater: I have previously talked about how much my husband loves the Good Man brand under shirts and let me tell you the sweaters are just as great. Soft, high quality, and fashion forward but not over the top!